Home-based records (HBRs) are an important tool for achieving, monitoring, and sustaining vaccination coverage but have often been underutilized in national immunization programs. Over the years, many countries have used a traditional format that may not be easy for health workers to complete accurately and legibly or for caregivers/parents to understand the data that are recorded. Also, all users may not understand or perceive the value of these documents. 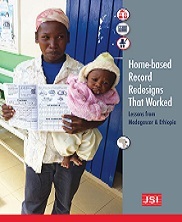 Redesign approaches in some countries have been successful in meeting the needs of health workers, caregivers, and the health system while also increasing the availability and use of these important records (with an overall objective of increasing immunization coverage). Experiences from Madagascar and Ethiopia — where the traditional vaccination card was redesigned and incorporated into an integrated communication tool — are highlighted in the following case studies. We share these experiences to inform countries who may be interested in undertaking their own redesigns as reference on the stakeholders involved, steps in the process, and key points to consider. JSI Research & Training Institute, Inc. 2017.